An irregular development in red blood cells in the human body is called sickle cell anemia. It is a serious disease in which the body red blood cells contort into a sickle shape ie, semicircular red blood cells.Normal red blood cells are like the size of the disc and look like rings without holes in the center. Iron is a rich protein in red blood cells, it is called hemoglobin. This protein transfer oxygen from the lungs to the rest of the body. After being sickle cell disease, red blood cells lose the ability to carry hemoglobin.This starts decreasing blood in the body and in the end in some critical cases the person dies. Irregular changes in genes which inspire the formation of hemoglobin in the body cause sickle cell anemia.In this disease sickle red blood cells block small blood vessels which supply blood to your bones. Sometimes this problem can also be genetic.If this problem is from any of the family or if one of the parents has this problem then children can show signs of this disease. 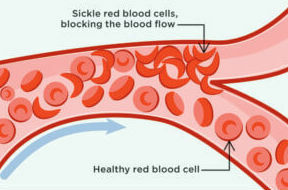 People suffering from sickle cell anemia complain of pain in the chest, stomach, arms, legs and other parts of the body. The pain problem starts in the area of ​​the body where blood circulation is stopped due to sickle cell. The problem of sickle cell anemia is also the problem of feeling tired or fighting infection. Apart from this, when people suffer from sickle cell disease, there is fever, cough and feel uncomfortable during breathing. People who suffer from sickle cell anemia, should contact the doctor without delay. Patient's blood test can be done to diagnose sickle cell anemia.Through which can be known about contaminated or poorly hemoglobin. A slight malfunction in hemoglobin means that the person has symptoms of sickle cell and not sickle cell anemia.